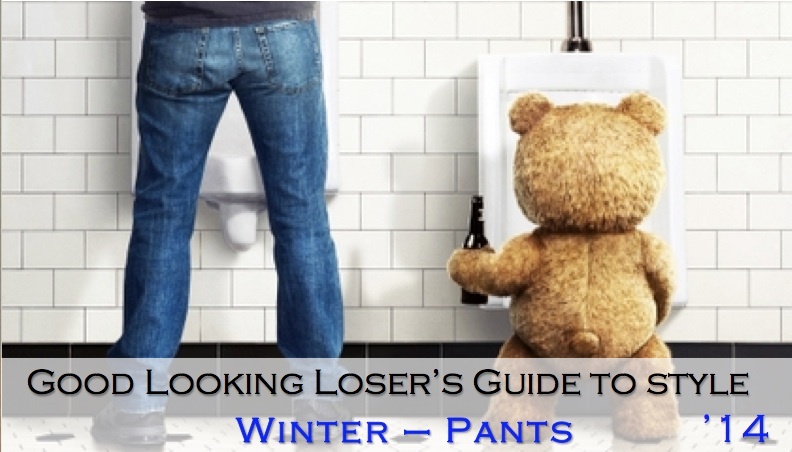 Welcome to Part 2 of "Good Looking Loser Winter 2014 Guide to Style". 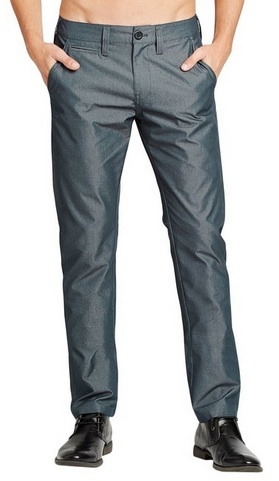 Unlike shirts and accessories, super inexpensive, fashionable pants are basically impossible to come by. 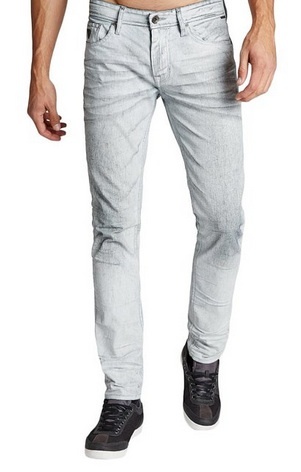 Aside from some men's pants by Guess, you should count on spending at least $75 for pants (fashionable jeans) that you like. While that may be discouraging to some, I suggest that you buy ONE pair that you love rather than 2 or 3 pairs that you don't really love. That should be cheaper anyway. Don't be the guy with a closet full of stuff he doesn't wear. Leave that waste of space and money to girls who dress up everyday to impress us. When I moved to Los Angeles in 2008, I literally wore the same pair of jeans (Super Rare Ozzy Osbourne inspired Affliction Red-Label Jeans, $300 and I had no money at the time) every single day for 18 or 20 months. Nobody ever "called me out" for wearing the same pants. To the girls I was seeing on a regular basis - those jeans were "me". Here is our Winter 2014 selection, commentary is by our 2 female Men's style experts unless otherwise noted. 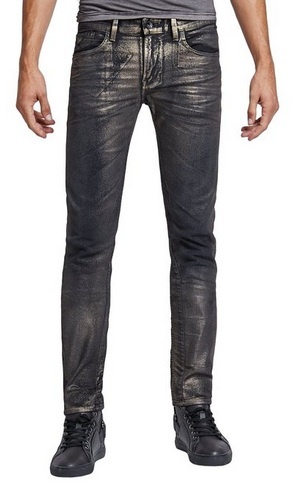 'Waxed' jeans, if not yet already official, will be the latest trend in men's fashion. 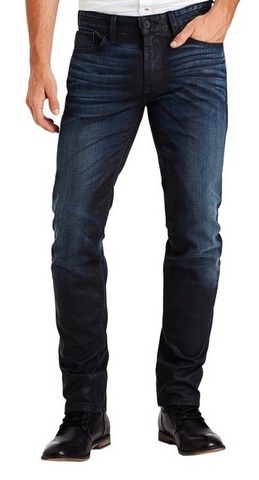 The jeans are not inexpensive, but they look tremendous. 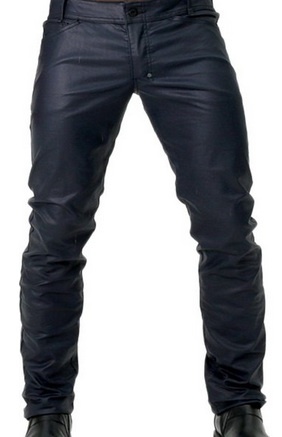 If you only owned one pair of pants, you'd look good everyday in a pair like this. Cool and edgy. The metallic color is evenly dispersed so it doesn't look like too much if paired with a solid shirt and some necklaces. The shirt should be a soft material (as shown). Nice dark wash for winter. 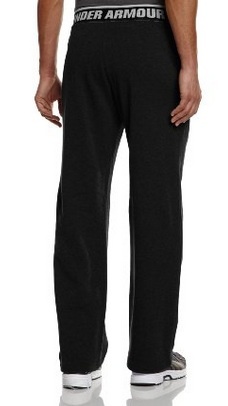 Very versatile, they go with button-downs or graphic tees for day and night looks. Current slim fit but not too skinny.